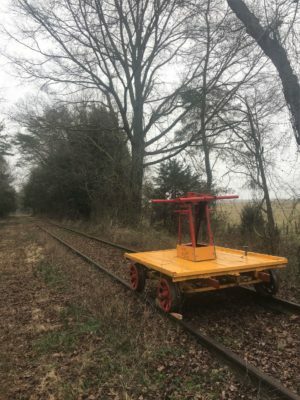 The Dahlgren Railroad Heritage Trail is a rails to trails project in King George, Virginia. The line was originally constructed by the Navy to connect the Dahlgren Naval Base with existing rail line in Stafford, Virginia. The rail land eventually was purchased by private citizens who dreamed of a public use as a recreational trail. The Dahlgren Railroad Heritage Trail (DHRT) website does a nice job of telling the history of the trail and how you can join to support it. 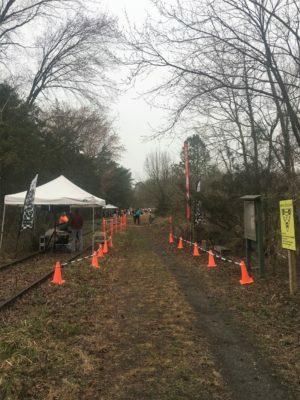 Race Timing Unlimited directs the Dahlgren Trail ½ Marathon on the last Saturday in February. They also run the Dahlgren 50k in August and multiple other events. The course consists of a 6.5 mile out and back from the beginning of the DHRT. 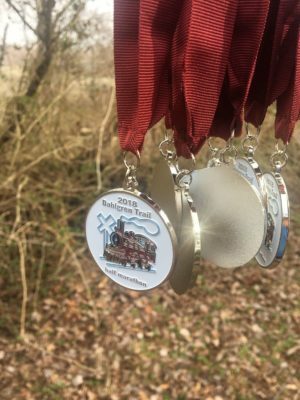 The trail is mostly crushed gravel with typical winter ground covering of leaves and gum balls from Sweet Gum Trees along the course. The ½ marathon is a part of Trailrunner Magazine’s Winter running series. 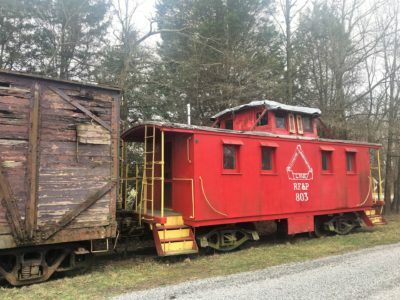 Registration on race morning takes place in the restored Caboose at the beginning of the trail, where runners could pick up their bib and shirt. There was also packet pick up at a local running store in Fredericksburg. I worked the start/finish line for the race. The race starts in waves because the beginning of the trail is narrow for the first bit. They start the elite runners competing for a cash prize first, then they start runners by age groups and gender. This allows them to easily track age group awards. At the beginning of the race, I was in charge of marshalling the groups into the corral and keeping them separated with a rope. 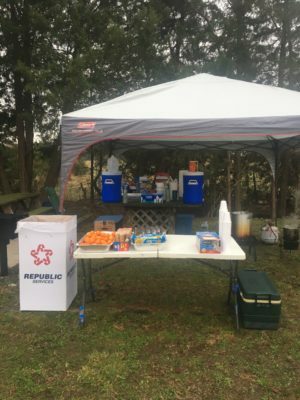 After all the runners started the race, I did the normal finish line work – filling cups of Gatorade and water, preparing chicken noodle soup for the runners so they would have something warm when they finished, and setting out sweet and salty snacks. 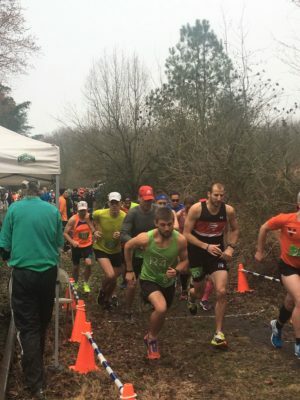 The lead runner was smoking fast – Michael Bailey from Chesapeake Virginia set a new course record 1:14:20 shaving 25 seconds off of the previous course record. The top 5 men all finished under 1 hour and 25 minutes. As runners came in I was fortunate to be able to hand out the finishers medals. The medals were cool circular medallions with a train on them. I really enjoyed watching the runners as they came through the finishers chute. You could see the hard work and effort that each runner gave as they came in. Vets to new runners, everyone was exuberant at the finish, and everyone was ready to be done. After runners cooled down, everyone congregated around the campfire to share stories and encourage the other runners coming in. The race was well organized and logistically everything seemed to run smoothly. Race Timing Unlimited puts on quite a few races. This one definitely had an old school trail run feel without a lot of pizzazz. The trail does all of the talking. I recommend giving this race a look if you find yourself in Virginia on the last Saturday of February.